So many fisheries come to mind where after dark patterns offer some of the best opportunities for catching fish. After dark strategies and locations however can vary dramatically from where we might find fish during daylight or twilight hours. What happens so often to us as anglers is that we simply figure out one window or movement of fish and when that window ends, we assume that the bite is over. Could be setting up on a classic point anticipating the sunset bite. A classic pattern might start in deeper water and as the day progresses to where the sun hits the horizon, we find an intense window of fish activity on top of the point that might last half an hour. What so often happens is that after this intense flurry, we quit marking fish and assume that the bite is over. The bite might indeed be over if we don’t make any adjustments but the reality is that we can prolong the bite and keep catching fish if we move with the fish. Of course there are also basin and transition bites as well like what we often see on Red Lake and Mille Lacs after dark. Perhaps the toughest aspect of catching walleye well after dark is forgetting some of the lessons we tend to learn during the day. 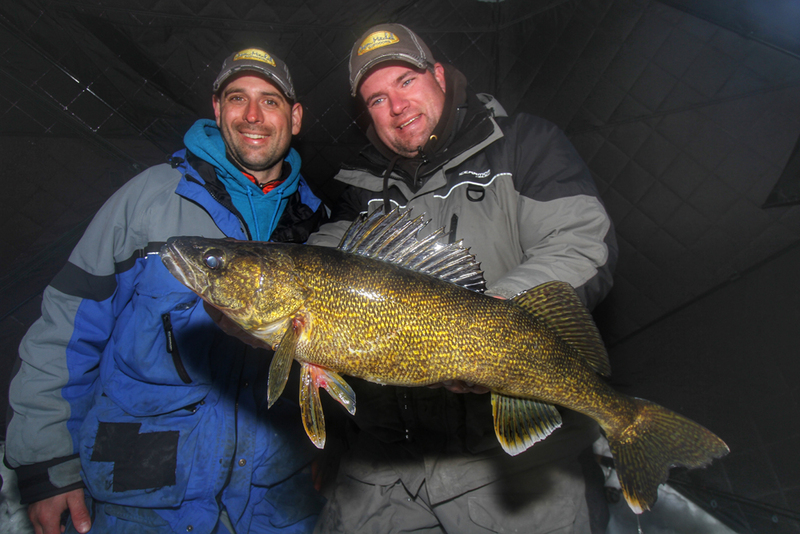 So often, finding and catching walleyes is all about reading structure and focusing on edges. After dark however, you can throw that edge mentality out the window. We often find walleyes roaming away from structure well after dark. Large expansive flats in shallow water are a favorite location. That four to six foot sand flat that is several acres might be void of walleye activity during the day where even sunrise and sunset patterns seem to revolve around structure that breaks into deeper water. In the middle of the night however, walleyes will often push up and roam much shallower water than what some anglers would envision. On some fisheries, walleye will also be more apt to eat much higher in the water column well after dark. We have seen many scenarios where we caught more walleye after dark by fishing half way down in the water column, especially for big fish. This is particularly true for set rods and tip ups with big bait. Like any other time of year, full moon periods can make some after dark patterns better but there will often be feeding windows that happen in intense flurries through the night. Don’t expect activity all night long, wait out the windows because ninety percent of the activity will happen during ten percent of the time. My favorite after dark locations and patterns are not necessarily classic walleye structure or breaklines that are close to deeper water. Typically, large flats or even basins and large shelves shine after dark. I use the whitetail deer analogy a lot when describing walleye patterns and movements. During the day, deer might follow an edge but come middle of the night, they might be more apt to be standing out in the middle of a soybean field that is several hundred acres. Walleyes can also be just as random after dark. Because the exact location of fish can be so random on large flats and shelves, fishing these locations takes a certain kind of mentality. You can spread out tip ups to increase the chances of contacting these roaming fish or you can fish out of a shelter but in this situation, you have to realize that the fish are going to find you. This isn’t a situation where you can necessarily move around to find these random fish, set up so that at some point during the night… these fish find you. The beauty of fishing well after dark is that these fish will be looking for you. What makes after dark patterns for walleye so much fun is that these fish are typically much more aggressive and these fish are looking for a meal. The bites are often much more intense. These fish will peel off much more line off a tip up for example or hit a lure repeatedly. Walleye after dark play by a different set of rules. Make the right adjustments to capitalize on some of the most intense walleye bites. When fishing after dark, I am a big proponent of using glow finishes on lures. Not always necessary but I have seen so many situations where we almost immediately caught a fish after charging a lure. 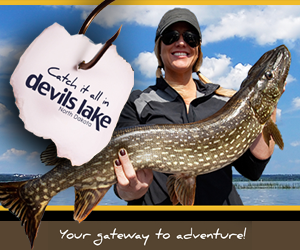 When using live bait on tip ups, don’t hesitate to use larger baits that are up to eight inches long. Clip the tails of rambunctious chubs and suckers so that they can’t trip flags or pull the roller around the spool. Strike indicators are nice to have on tip ups. Other nice tools for the grave yard shift include head lamps and LED lights for inside shelters. LED light sources have about replaced a lot of traditional propane lanterns. What can make the after dark period so fun is the intensity of the mayhem. You can have an hour or two of complete silence interrupted by the most intense feeding windows. The bite is often a full on blitz where it seems like every line has a fish. 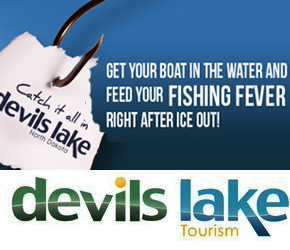 Where every tip up is out of the water and there are fish flopping all over the ice. Realistically, this after dark window is what can make spending the night in a fish house so appealing. Tangled rattle reels and chaos. On so many fisheries, the period between sunset and sunrise offers some of ice fishing’s most exciting walleye fishing.